The Hamilton Golf and Country Club has been awarded the PGA Tour's Canadian Open in 2019 and 2023. This year's tournament will be held at Glen Abbey Golf Club in Oakville, Ont., for a fourth straight year from July 26-29. 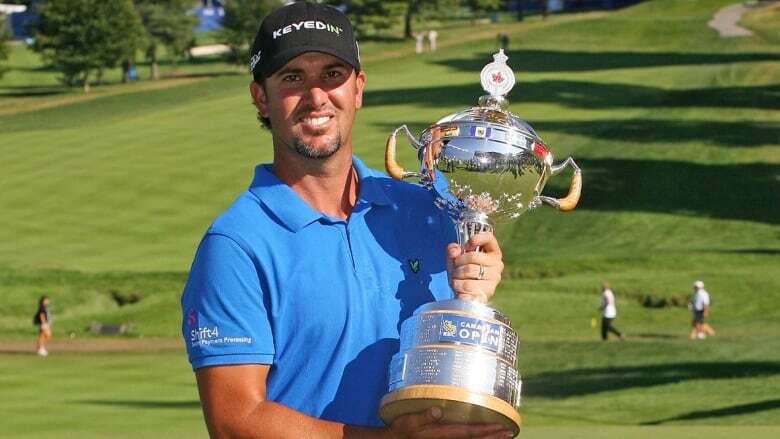 The Hamilton Golf and Country Club has been officially named as host of the RBC Canadian Open in 2019 and 2023, finally confirming what had been anticipated since the membership voted to pursue negotiations for the event back in February. The official announcement was made Wednesday at the historic course in Ancaster, Ont., located along the Niagara Escarpment in the west end of the city. It will be the first time since 2014 that the PGA Tour event has not been held at Glen Abbey Golf Course in Oakville, just down the highway. Glen Abbey will host this year's tournament July 23-29. "Hamilton is so great on so many levels," said Golf Canada CEO Laurence Applebaum. "It's an exquisite golf course inside the ropes. And the other part of it is, outside the ropes, they've got this wonderful canvas, this wonderful property that we can engage fans, host a lot of people, have great and convenient parking, and just make a really great activity for all golf fans." Golf Canada was not able to announce a specific date for the tournament because the PGA Tour is currently revamping its schedule. Speculation has been that the event may move from its current spot in late July to one in June around the U.S. Open. That may increase the attractiveness of the event to the game's biggest stars. Since 2007, the Canadian Open has taken place right after the British Open when most A-list players would rather take the week off after playing an overseas major. This will be the sixth time the tournament has been held at the Hamilton course originally designed by English architect Harry Colt, and will mark the 100th anniversary of its first appearance here in 1919 when James Douglas Edgar won, and a 17-year-old Bobby Jones finished second. It has also hosted in 1930, 2003, 2006, and 2012. Applebaum said the Hamilton course is also very popular with players. "One of the really important constituent groups we look to is the PGA Tour players," he said. "And we've been getting phenomenal feedback on really the courses that they like playing, or they look forward to playing, or they have played. "Hamilton's one of those classic builds that really suits a lot of players. They know it. They've enjoyed it and they've been here before. Really there's a nice groundswell of players looking forward to coming back to Hamilton." Lloyd Ferguson, city councillor for Ancaster, said the city has committed to a financial contribution, but would not go into specifics because there are still discussions going on with possible partners. Glen Abbey has been the most frequent host since the tournament's inception in 1904 (30 times), but the course's future has been in doubt since 2015 when owner ClubLink filed plans to redevelop it into a residential area with retail and office space. Oakville residents and town council have fought back on those plans, designating it a property of cultural heritage value or interest under the Ontario Heritage Act, and in January passing amendments to its zoning bylaws and official plan, as well as a conservation plan to restrict building. Applebaum said Golf Canada has not ruled out returning to Glen Abbey in the future but is "speaking with a variety of people" about hosting 2020, 2021, and 2022. "We've had a great relationship with ClubLink. They've been a wonderful partner and host. And we continue to look forward to focusing on 2018 and having a great championship then," he said.